The DIY Bride: Frequently Asked Questons Answered! Hello all! Over the past 3 months since the wedding, I've been receiving excellent feedback from so many people (Thank you!) and have been getting a lot of questions regarding our wedding. So I wanted to take the time to answer these questions for you all. Keep in mind that I will be summarizing and grouping some questions together. For example, I have been asked about my dress, hair, shoes etc. all on separate occasions so I will group this all into one question and one answer. 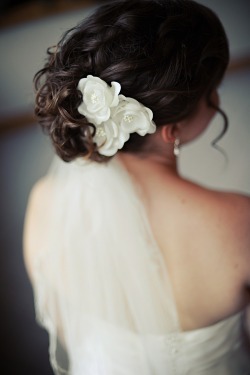 Where did you get your bridal attire? My dress is from the Oleg Cassini collection at David's Bridal. The style number is CT314 and you can view it by clicking here. My shoes were on clearance at Shoe Carnival $9! Unfortunately, they are no longer available. However, mine are a size 7 and if you're interested in them feel free to email me at diy(dot)bride(at)yahoo(dot)com. My crinoline was also purchased from David's Bridal. The style number is 603 and you can view it by clicking here. Mine is still for sale and if anyone is interested in please email me at diy(dot)bride(at)yahoo(dot)com. My earrings were bought from Macy's on sale. You can view them for sale on their website here. My bracelet was handmade by me and you can make one too by following the directions that I created for making pearl necklaces. I bought all of the supplies to make the necklaces and my bracelet from Hobby Lobby. In terms of my hairstyle for the wedding, I've been getting incredible feedback, and many have asked for pictures of the back to share with their hairdressers. You can view the back of my hair here and here. Where did you get your groom's attire? The suits worn by my husband, his groomsmen and my father were all rented through Jim's Formal Wear. The exact suit that was rented can be found by clicking here. In our area, each suit rented for $100 each, which included the jacket, pants, shirt and a tie. Shoes were sold separately, but the men in our bridal party just wore their own brown shoes. At the end of the day, the guys really liked the suits and boasted on how light and comfortable they were. My husband's tie was purchased from The Tie Bar. The same tie is still for sale and can be purchased here. The groomsmen tie's were included with the suits that we rented and we rented them in the color, "Mandarin." Will you be providing templates for your stationary projects? Absolutely! I've had to purchase a new laptop since my old one is having issues. My old laptop has all the stationary templates on it and I haven't been able to get them to open since my old laptop is on the fritz. So I may have to start from scratch on those, but as I finish them and find time to work on them, they will definitely be posted! Where did the bridesmaid dresses come from? The dresses were purchased from David's Bridal as well. The style number for the dresses is F13287 and they were the, "Tangerine," color. You can view them on their website here. Where did you order your parasols? The white parasol that was used to create my Thank You Parasol was purchased from Asian Ideas. My hot pink parasol and the orange parasols were purchased from Hobby Lobby. Unfortunately, they were purchased on clearance and are no longer available. All of the parasols were 32" in diameter when fully opened. Where did you order your paper lanterns? The paper lanterns were purchased from two different websites. The hot pink and tangerine lanterns were ordered from Asian Ideas. The yellow lanterns were purchased from the Paper Lantern Store. The hot pink and tangerine lanterns were 14" and the yellow lanterns were 10". Where did you order your guest book? When I ordered my wedding gown, I received a coupon code from Shutterfly for a free Hardcover 8x8 Photo Book. All I had to do was pay for shipping. I just chose to use our engagement pictures to create the book and add lines to pages for people to sign. What kind of food did you have catered? Where did you get your garters from? My garters were purchased from Etsy through seller luly612. You can view her shop and the garters I purchased by clicking here. Where did you get your hair flowers from? Were they fresh or silk? 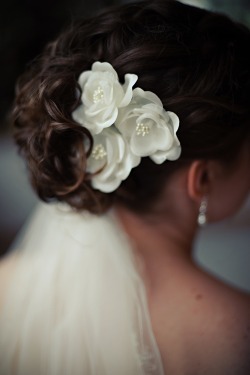 The hair flowers were silk and were also purchased on Etsy through seller PrimandPosies. You can view her shop by clicking here. I really hope that a lot of you will find this helpful and fell free to email me if you have any additional questions! Thanks for all of the info! I loved your wedding. Plus, one of my really great friends lives in Muncie! It can't be that big of a town, right?